While I am awaiting feedback on the last assignment for A Creative Approach I have used the time to complete a few other projects, a couple of which were works in progress from before I started this unit. Below is “Sea Siren”. This is a lifesize mask made from felt that I sculpted over a mould and stiffened to hold the shape. 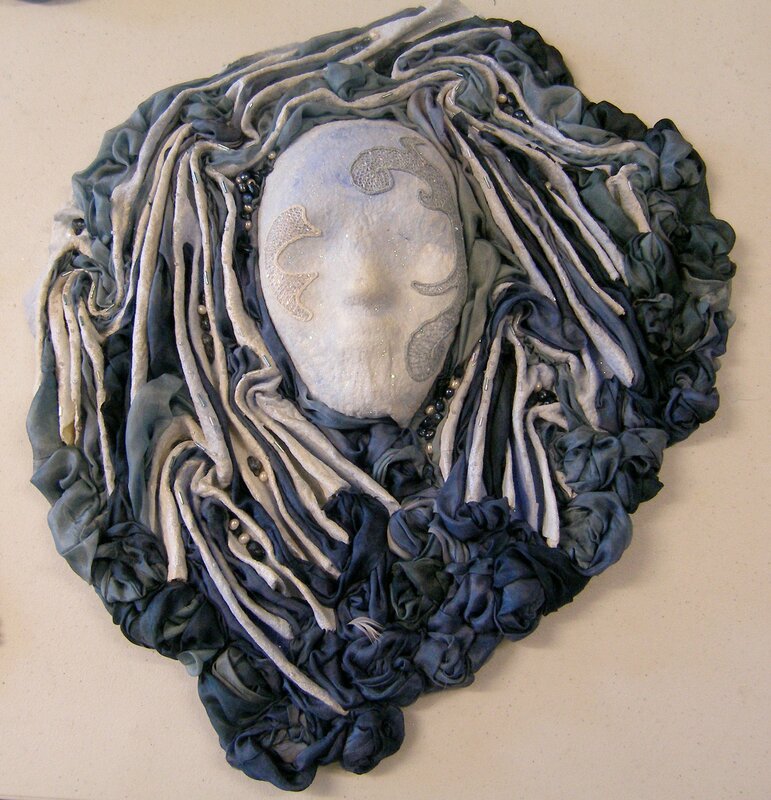 The felt extends in a single piece around the mask and I pleated and swirled this to form water like waves and ripples. I sponged the face with acrylics and stitched designs onto it using needlelace techniques. I had got that far before I started A Creative Approach but wasn’t satisfied with the outcome so put it to one side. I recently started work on this again, and decided it needed a lot more depth of colour so I added the darker blue silk fabric which I inserted into the channels in long strips. I formed the ends of the strips of fabric into swirls and stitched these into place around the edge to add more texture and dimension. The final touch was a scattering of white and blue pearls to add a bit of sheen, another texture and pick up on pearls of the sea. A more traditional piece of textiles I have just finished is a quilted jacket. I started hand sewing the squares together on a holiday a couple of years back and it has been one of those long projects just worked on when I was away from home and needed a portable project to hand. When started I had originally planned to make a full quilt, but once I started A Creative Approach I decided that I would be unlikely to spare the time to make enough squares for a quilt so I shortened the project into a jacket. 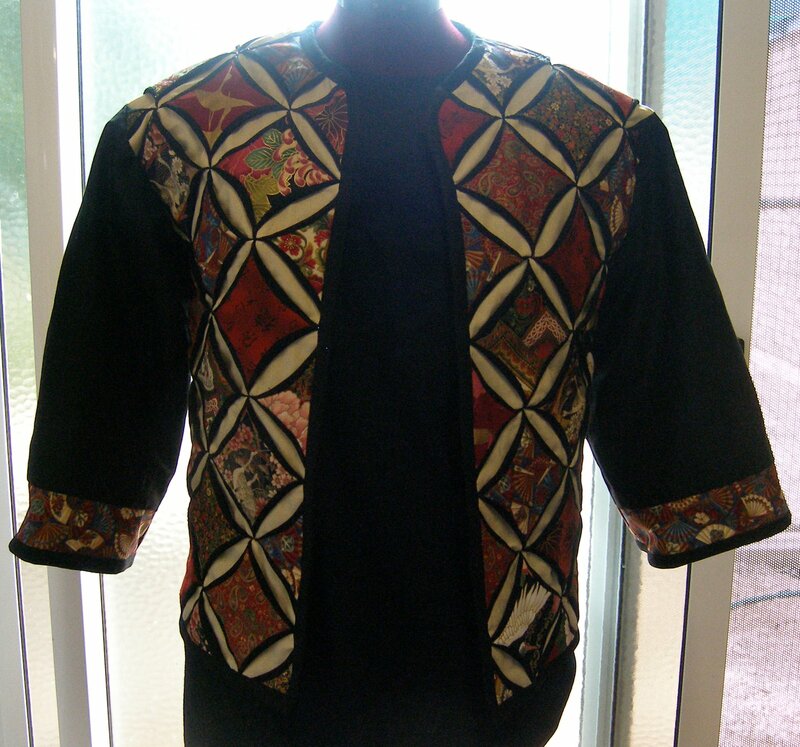 I selected a boxy style jacket with minimal shaping to really show off the pattern which is called Cathedral Windows. 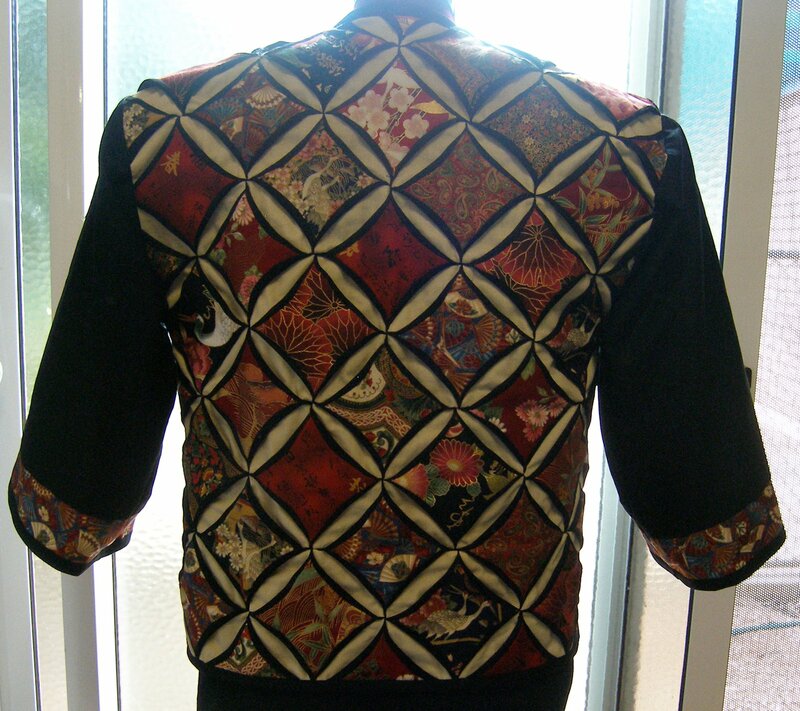 I selected Japanese themed fabrics with a red and black overall colour theme.